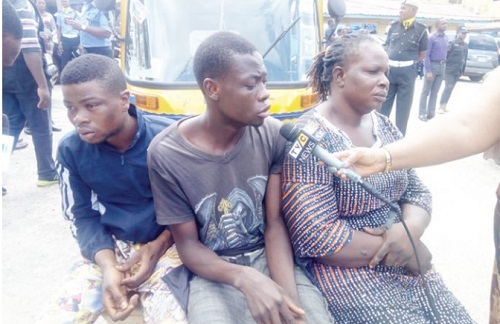 Men of the Lagos State Police command have smashed two robbery syndicates, one of which operates using a tricycle, popularly known as ‘Keke’ as operational vehicle to dispossess their victims, while the other gang breaks into victims’ vehicles with chemicals during robbery operations. Five members of the syndicates have been arrested. Parading the suspects on Monday in Lagos, Commissioner of Police, Lagos State Command, Edgal Imohimi noted, “There were two sets of robbers on parade today. "The first set whose names are listed below, use a tricycle pretending to be genuine transporters. When people board the suspect’s Keke Marwa they take them to an isolated place and rob them of valuable items." According to him, the suspects usually operate along Ebute-Ero, Lagos Island and Apapa axis. According to him, exhibits recovered from the suspects include one tricycle with Reg No. BDG 318 AE, one Huawei android phone and one Itel android phone. The police boss disclosed that another gang of robbers who specializes in breaking into people’s cars by means of a chemical agent which they pour on the window glass or windscreens to gain access into the car were also nabbed. The suspects include Teslem Abiodun (male) and Kazeem Akolade (male) and the exhibit recovered from the suspects include eight laptop computers. Confessing to the crime, Monsuru and Jamiu said that the Tricycle with which they use for the operation was given out to one of their friends on hire purchase basis, adding that they decided to use it for robbery operations because they believed it will earn them more money. They said that they have used it to rob passengers on several occasions particularly at the boundary axis of Ajegunle. According to the suspects, the female member Queen Victor does not go with them during operations but receives the phones they rob and sponsors them for operations if they did not have money.